A Tsukihime spinoff manga authored by Takeru Kirishima, who also did the Melty Blood manga and Melty Blood X. 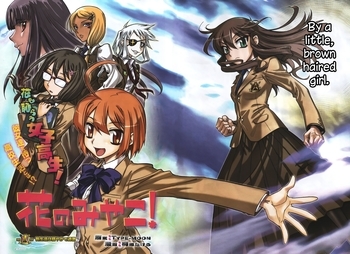 Taking place in a high school entitled the Asagami Academy (the same one Akiha attended in Tsukihime, albeit a bit different now), where student rankings are decided by strength, with higher rankings meaning more privileges. A few of the highest ranked students form the Crimson Moon Committee, who pretty much run things. The principal freely admits that this is barbaric, interferes with actual education, and leads to lower-rankers being treated like dirt, but won't actually do anything about it. As the title would imply, the main character is Miyako Arima, now a few years older. Miyako is attempting to be as normal and unnoticed as possible, after having spent most of middle school beating people up. Naturally, she repeatedly screws up and gets into fights. And then, things spiral completely out of control as soon as she gets involved with the other protagonist of the series: a small girl of Miyako's age by the name of Shiki Nanaya. As of December 2014, the serialization has been cancelled, but it's being continued as an officially Type-Moon approved doujin. Absurdly Powerful Student Council: The Crimson Moon Committee. Though, they aren't technically the student council. Camelot International School apparently also has one, although we only ever see the president. A-Cup Angst: Gila shows shades of this. Amusing, since the person who provokes this reaction is, of all people, Akiha. Gila likes Arturia, who considers Arc his 'Guinevere', and Arc would rather they both stayed far away from her. Kunitsuna and Ami both like Miyako, who would rather that neither of them ever came anywhere near her again. Alternate Identity Amnesia: Shiki is completely unaware whenever SHIKI takes over. The only time she even notices the missing time (generally only a few seconds due to convenient interruptions) is in the final chapter of Part 1, and even then she just assumes she blacked out. Anger Born of Worry: Shiki has some choice words for Miyako when she just disappears, immediately after having an intense fight with the number 4 ranker. Awesomeness by Analysis: Maria's best skill, along with her anki. It's a specialty of the Eltnam familiy. Blood Knight: A distressingly common personality trait. The most prominent example is Ami Kuzuki, who will fight anything and everything and love it, and is constantly trying to goad Miyako into a fight. Boxing Battler: Kunitsuna, who's actually a pretty skilled fighter. It's just that every time we see him in action, he's up against Miyako. Broken Pedestal: Maria goes through this basically every time she learns anything about Arc. It gets rebuilt pretty fast each time, however. Club Stub: The plot starts with Shiki desperately trying to recruit new members for the Aikido club, and settling on Miyako. Day in the Life: the last (serialized) chapter stops to show what an average morning for Ami Kuzuki is. Discontinuity Nod: The author was specifically directed to ignore Character Material version of high-school Miyako... But she still joins the Aikido club, and at one point even wears the 'Cap Girl' outfit, albeit under a hoodie. Does Not Know Her Own Strength: Kishima has an unfortunate habit of forgetting that she's strong enough to send people flying with her animated gestures. Shiki is always the one on the recieving end. Duels Decide Everything: Asagami Academy in a nutshell, really. Deuteragonist: Amusingly, the title character. Shiki is the real protagonist. Everybody Was Kung-Fu Fighting: At least, everyone in Asagami. The styles vary wildly, though: Miyako does a hodgepodge of Bajiquan, Kung-Fu, Nanaya techniques, and completely made-up stuff, Shiki "knows" Aikido, Kunitsuna boxes, Ami uses a bit of everything, Kureha does Tae-Kwon-Do, etc. Shiki: Why were you staring at me? Something stuck on my face? Miyako: Your eyes, nose and mouth. Shiki: Geez, Miyako, you sound like a boyfriend! Expy: Numerous. Shiki Nanaya of Shiki Tohno, SHIKI Nanaya of Shiki Nanaya, Maria E. Sokaris of Sion Eltnam Atlasia, Maki Akasa of White Len, Gila Gilgamesh and Arturia Pendragon of Gilgamesh and Saber, Arc Kizuki of Archetype:Earth, Kureha Kishima of Kouma Kishima, Lance of Lancelot, Kuuga Fujimura of Taiga Fujimara, and possibly Akiha Tohno of Akiha Tohno, if they aren't simply the same person. Expressive Accessory: The icon on Ami's eyepatch changes based on her mood. Extranormal Institute: Asagami is apparently this, being described as a 'nest for monsters'. Flash Step: Miyako pulls a couple of these, most notably to get past Maria's otherwise impenetrable defense. Future Badass: Miyako is capable of sending a man three times her size flying several metres with one punch, causing earthquakes although that might have been SHIKI and replicating Berserker Li Shuwen's Noble Phantasm, without the TATARI boosts she had during Melty Blood. Girly Bruiser: Fujiya Asagami and Kureha Kishima, who are two of the strongest characters in the setting. Gratuitous Ninja: Apparently, Asagami has a Ninjutsu Club. Sakura Kurogiri is a member. Gym Class Hell: Supposedly. It's never seen, however. Also, each of the characters from demon-hybrid families are presumably this, or approaching it, anyway. That'd be Miyako Arima, Kureha Kishima, and Kunitsuna Kugamine. Huge Schoolgirl: Kureha is absolutely huge, towering above almost the entire cast, even the adults. The only person even approaching her height is Minoru. Idiot Hair: Shiki has a rather long one. Like many other examples of this trope, it tends to reflect her mood: drooping when she's sad, sticking up when she's surprised, curling into a heart when she has a crush, and stiffening when she sees Miyako in a swimsuit. I Just Want to Be Normal: Miyako does her best, but things keep happening. Laser-Guided Amnesia: Miyako doesn't appear to remember ever knowing anybody named Shiki prior to this. Although, she does find the name nostalgic despite. Lovable Jock: Multiple, but most notably Mitsuzuri. Meganekko: Miyako started wearing glasses in an effort to be more normal. There's also Hanei and Akiha. Neuro-Vault: Shiki Nanaya may or may not have that Shiki Nanaya hiding in her mind. 108: Kureha Kishima's stated number of wins. With zero losses. Our Demons Are Different: There are at least three characters from known demon-hybrid families: Miyako Arima, Kureha Kishima, and Kunitsuna Kugamine, each of whom displays a level of superhuman speed, strength, or toughness in varying combinations. Real Men Wear Pink: Minoru 'The Giant' Mitsuzuri, number 10 in the rankings, is fond of cute things, sewing, tea, and cooking. His profile in chapter 9 hints that he may be transgender. Samus Is a Girl: Gender-flipped for Arturia. Say It with Hearts: Ami's sentences tend to gain hearts on the end when she's talking about Miyako. The icon on her eyepatch changes to a heart, too. Schoolgirl Lesbians: Shiki and Miyako are pretty obviously this, but Shiki will deny it to her last breath. School of Hard Knocks: Obviously. Shout-Out: At one point, Miyako recites lines from an old historical drama before fighting some Camelot bullies. Two of them happen to be fans and they yell the corresponding lines as they attack her. Social Darwinism: The Doctrine of Supremacy that Asagami Academy follows. Spin-Offspring: Ami Kuzuki has the... interesting honor of being in a Tsukihime spinoff while also being the (biologically impossible) daughter of two Fate/stay night characters. Superpowered Alter Ego: SHIKI certainly seems to be this, tanking the Hammer of the Wind King without a scratch and charging straight at Arturia as she prepares the Sword of Promised Victory. Stalker with a Crush: Ami is this to Miyako. Not So Stoic: but definitely isn't, especially when she spends over half an hour sitting completely still just to mess with Shiki. Tranquil Fury: After Maria bullies Shiki in front of nearly the entire school, Miyako steps in. She is, outwardly, completely calm and stone cold in every way, not even raising her voice, but underneath she's out for blood. Miyako: Save your words. I'll tear you to pieces. Vitriolic Best Buds: the 'Idiot's Trio' are this to Shiki, mocking and teasing her at every turn, but also quick to support her whenever they can. Violently Protective Girlfriend: Miyako, to Shiki.